The Reformation Commentary on Scripture from InterVarsity Press on Vimeo. The Reformation Commentary on Scripture (RCS) follows an ancient practice of biblical commentary, in which the scriptural texts are elucidated by chains of passages collected from the authoritative insights of the church's great exegetes. Each volume consists of the collected comments and wisdom of the Reformers collated around the text of the Bible. Here is a unique tool for the spiritual and theological reading of Scripture and a vital help for teaching and preaching. With the Reformation Commentary on Scripture you have centralized access to treasures that very few can gather for themselves. The series introduces you to the great diversity that constituted the Reformation, with commentary from Lutheran, Reformed, Anglican, Anabaptist and even reform-minded Catholic thinkers, who all shared a commitment to the faithful exposition of Scripture. The Reformation Commentary on Scripture provides a crucial link between the contemporary church and the great cloud of witnesses that is the historical church. The biblical insights and rhetorical power of the tradition of the Reformation are here made available as a powerful tool for the church of the twenty-first century. Like never before, believers can feel they are a part of a genuine tradition of renewal as they faithfully approach the Scriptures. 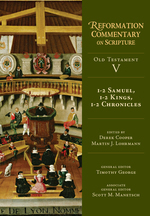 In each volume of the Reformation Commentary on Scripture you will find the biblical text in English, from the English Standard Version (ESV), alongside the insights of the leaders of the Reformation, from the landmark figures such as Luther and Calvin to lesser-known commentators such as Peter Martyr Vermigli, Johannes Oecolampadius, Martin Bucer, Johannes Brenz, Caspar Cruciger, Giovanni Diodati and Kaspar Olevianus. Many of these texts are being published in English for the first time. Each volume is designed to facilitate a rich research experience for preachers and teachers, and contains a unique introduction written by the volume editor, providing a reliable guide to the history of the period, the unique reception of the canon of Scripture and an orientation to the thinkers featured in the volume. Volumes also contain biographies of figures from the Reformation era, adding an essential reference for students of church history.